181. BrunauerS., Mikhail R. Sh., Bodar E. E.—J. Colloid. Interface Sci., 1967, 24, 451. 182. Hadymass Ju., Brunauer S., Mikhail R. Sh.— J. Colloid Interface Sci., 1969, 29 485. 183. Lyklema J.—Croat. Chem. Acta. Special Publ., 1970, N 1, 51. 184. S t a m m W., Huang CP., Jenkins S. R.—Croat. Chem. Acta. Special publication, N 1. Zagreb, 1971, 143. 185. 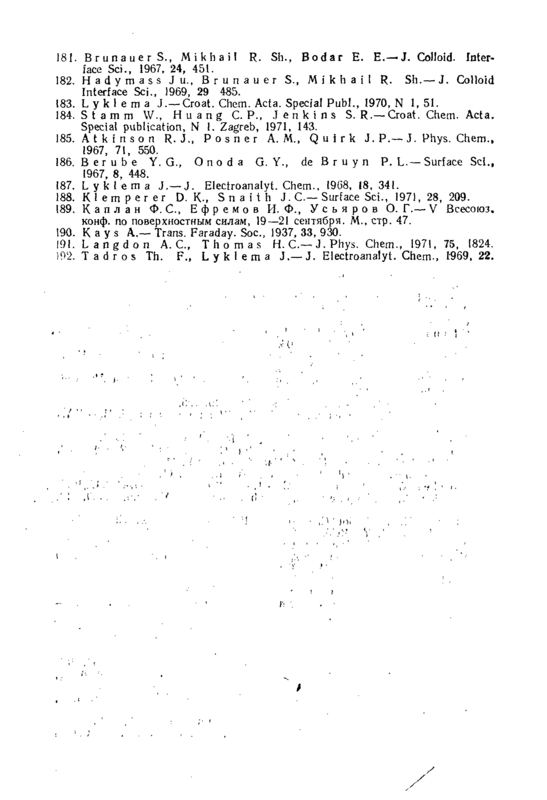 Atkinson R. J., P о s n e r A. M., Quirk J. P.— J. Phys. Chem., 1967, 71, 550. 186. B er u be Y. G., Onoda G. Y., de B r u у n P. L.— Surface Sci., 1967, 8, 448. 187. Lyklema J.—J. Electroanalyt. Chem., 1968, 18, 341. 188. K 1 em p er er D. K., Snaith J. C—Surface Sci., 1971, 28, 209. 189. Каплан Ф. С., Ефремов И. Ф., Усьяров О. Г.— V Всесоюз. конф. по поверхностным силам, 19—21 сентября. M., стр. 47. 190. Kays A.— Trans. Faraday. Soc, 1937, 33, 930. 191. Langdon А. С, Thomas Н. С—J. Phys. Chem., 1971,75, 1824. 192. Tadros Th. F., L у k 1 е m a J.—J. Electroanalyt. Chem., 1969. 22.